The Palace Chapel was established by Alexandra , and it replaced a sitting room of Maria Alexandrovna, wife of Alexander II. Alexandra's ill-health made it difficult for her to go outside of the palace to the local church. Until the construction of the Fyodorovskii Sobor in 1912, which was on a secluded part of the Palace grounds, none of the local churches felt like 'home' to Alexandra. In Tsarskoe Selo there was the great Catherine Cathedral, but it was the chief cathedral of the town and always full of worshippers. Alexandra hated to be gawked at, particularly when she was praying, so she avoided visiting the town's churches until off-hours when there were few people about. The Orthodox liturgy was very important to Alexandra and she tried to hear it as often as possible. She insisted her children attend frequently, as well. For convenience's sake the Palace chapel was indispensable and frequently used. In the picture above an ikonostasis that belonged to Alexander I can be seen crossing the center of the chapel. This screen followed the Emperor from Russia to Paris and back as part of the furnishing of Alexander's travelling camp church. The ikonostasis is now in the Menshikov Palace. Above: The Back of the Imperial Chapel. The door leads into the Billiard Hall. During services in the chapel the Imperial Family entered from the Billiard Room after servants and courtiers had already assembled in order according to their position with the highest closest to the altar on the right side of the ikonostasis. The Romanovs sat behind the glass screen shown above. 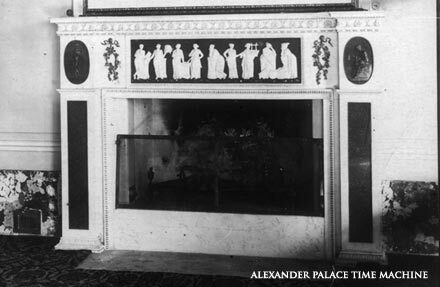 During their six month captivity after the revolution in the Alexander Palace the Romanovs had services as often as possible in the chapel. They weren't allowed to visit the Fyodorovskii Sobor or any other local churches, so the Chapel and Alexandra's small bedroom oratory where the only places for the religious observances that were so important to the family. Priests from local churches and members of the famous Imperial Choir came to the palace to perform the liturgy. In former days these services were packed with courtiers, servants and the nobility, but after the revolution thing were quite different. Although there were plenty of soldiers and guards outside the palace, within there were only a few to be seen. Services were now attended by two dozen or so people - servants, palace officials, a few friends and the family. Just beyond the walls of the chapel revolution and chaos reigned, but within life went on as it had for generations. The solemn chant of the Orthodox service, clouds of sweet incense, clergy and choristers dressed in splendid vestments of gold, silver, silk and damask - the atmosphere of Old Russia made the turbulent events outside seem like a bad dream. The chapel was designed by Quarenghi and shows his hand in the crisp carving of the column capitals and cornices. The room is long and rather narrow, with an arcade running along the right side of the room. Artificial marble in a icy sea-green covered the columns and walls. The wall panels were framed in a darker colored marble. Russian artificial marble is difficult to produce and maintain. The chapel wall coverings where created in Quarenghi's days and were restored at great expense by Nicholas II. Maria Alexandrovna loved Tsarskoe Selo and made the Alexander Palace her refuge from the hustle and bustle of St. Petersburg. In the watercolor above one can see the Chapel as it was in her time, a spacious drawing room filled with red upholstered, dark wood furniture on a machine made, patterned red carpet. On the left, near the window, can be seen the great gilded vase which was later moved to the Semi-circular Hall. This room was one of the most comfortable of the rooms in the palace and a perfect place for peace and quiet. Outside the windows was a spacious balcony, installed with a mechanical hoist to lift heavy orange tree planters onto the balcony. The sharp, heavy, citrus fragrance of the blossoms would drift with the breeze into the room on summer days. Maria Alexandrovna was seriously ill in her later years and redrew from society. She spent more and more time in the Alexander Palace, which reminded her of happier days when she and her husband spent summers here. Her son, the future Tsar, Alexander III, and his wife took up residence in the palace. This was, in part, to be near his ill mother. The photograph above, right shows the condition of the former chapel today.